A 10-hour ceasefire by Russian and Syrian government forces in Aleppo has come to an end, in what Russia described as a final chance for rebels to leave besieged areas. No-one left, activists said. Russia and Syria are now expected to resume attacks on the city's eastern side. Rebels continued a counter-offensive aimed at breaking the siege, and Russia said two of its soldiers were wounded. About 250,000 people are trapped in the east, amid food and medical shortages. If the rebels leave eastern Aleppo, analysts say, it will be a big victory for President Bashar al-Assad in the five-year war. Text messages sent to residents by the Syrian government urged civilians to leave the area, telling the opposition to "stop resisting or die". It added that they would "destroy group leaders". According to the Syrian Observatory for Human Rights, a UK-based monitoring group, no-one had left the areas during the so-called "humanitarian pause". Rebels were given the chance to leave unharmed with their weapons, using two specially created corridors. Six other routes were opened for civilians. Syrian state media accused the opposition of preventing residents from fleeing. It reported that rebels fired rockets at one of the evacuation passages. And Russia's defence ministry said two soldiers who were monitoring the ceasefire were lightly wounded by shelling from home-made gas canister bombs and mortars that hit the western part of the key Castello road route. Rebels in eastern Aleppo had increased their attacks on western government-held areas of the city on Thursday. At least 12 people had died and 200 were injured in rocket fire, gunfire and car bombs, state media reported. Government forces have been besieging the rebel-held east almost continually since July. This was the second time Russia and the Syrian government had said passages were open for evacuations, but their last unilateral ceasefire in October ended with almost no-one leaving over three days. 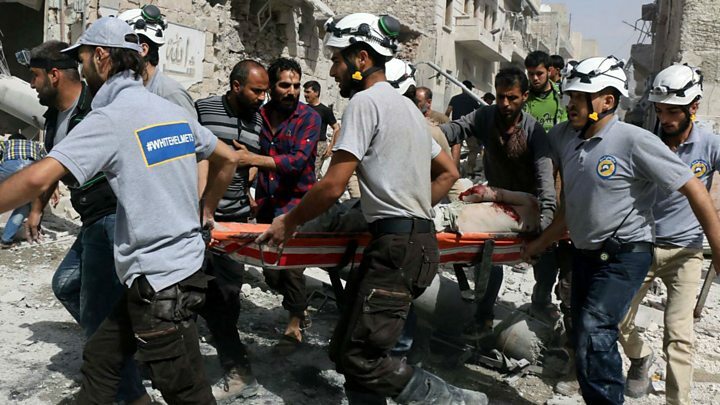 The UN, meanwhile, said it could not use this temporary ceasefire to deliver aid to the besieged areas because it did not have the needed security guarantees. And a spokeswoman for UN Syria envoy Staffan de Mistura said the organisation was also against the evacuation of civilians unless it was voluntary. Save the Children warned that injured children in eastern Aleppo would remain trapped without access to vital medical treatment and unable to leave, as the corridors failed to offer a viable solution for civilians in need. Meanwhile, a Russian helicopter was damaged by mortar fire while delivering aid, near Palmyra in Homs province, the country's military said. It could not fly back to base but the crew were rescued and are safe. The so-called Islamic State group may be behind the attack. 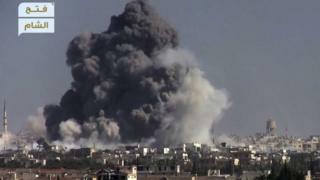 It claimed to have shot down a Russian attack helicopter in Homs province in a strike which it said killed the crew.